This is about Colleen from KCRlehrstudio, who had been a frequent visitor and supporter of EtsyLounge and the talented artists of Etsy. The first photo is Colleen's beautiful necklace, the second is a scarf she purchased from me, and the third and fourth photos are among the superb pieces I found by spying on her favorites. As you can see, Colleen has exquisite taste :) not only in what she makes and sells, but in what she admires. OK, so I realize I am complimenting Colleen's fine taste in part for choosing my scarf, but that is where my personal gratitude comes in. I awoke today not planning to blog, but just felt a compulsion to express my appreciation of people like Colleen, who, along with several followers of this blog, have gone out of their way to participate in this effort to seek out excellence on Etsy, & raise awareness and support for handmade. Colleen, with her academic knowledge of the arts and her background teaching art to high schoolers, has a keen sense of how history and tradition carries through in art being produced today, and has written features for EtsyLounge (July 8th and August 6) If you'd like to see more remarkable things Colleen has created or has hearted, have a look through her personal favorites! *The pictures are linked directly to these Etsy stores, so click on them to see more from these artisans. 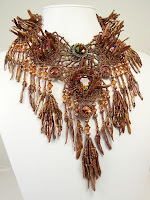 Colleen's intricate & detailed necklace is truly a work of art. I also love the third photo from her favorites, totally my style! What a lovely blog you have! 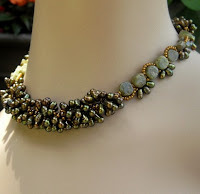 Thank you for featuring my "Sticks & Stones" necklace today. It has been a popluar piece! 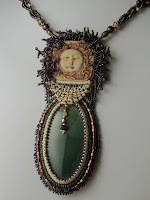 It won the sweepstakes prize in the MN State Fair beaded jewelry competition. It sold on the 2nd of October, but I'm so glad you link to my shop, as I do have many other items for sale. My work is currently featured in a Minnetonka, MN art gallery, and will be also featured at the Textile Center at the end of the month. Hey LifestyleBohemia, Are you referring to the Turquoise asymmetical necklace from Colleen's faves? If so, I totally agree -- that thing is sublime. So many of her picks appeal to me. Beautiful colors and textures. Stunning pieces. Loved the wrist warmer kit on you site...my have to bug my friend Loretta to make it for me. Thanks for highlighting such great designs. What an awesome way to celebrate Sunday! I was totally surprised and thrilled to get Andria's convo that I'd been blogged. What an honor. I am truly humbled because I am always in awe of so many talented ETSY artists. What great company to keep! Best wishes to all of you in your creative endeavors. I am always in awe! 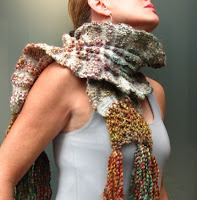 Andria- I have long admired your work and lusted after the fibers and look forward to wearing the shawl. Many thanks for your warm thoughts. You are appreciated. mmmm gorgeous work. Love the texture and colours in each piece. Andria, your fibrework is simply gorgeous. Very lovely items indeed! Heirlooms of the future. I just received Andria's scarf pictured above in last evening's post and only a temperature above 65 kept me from wearing it today. It is even more inspiring in person. The very unusual and totally original technique including felting is wonderful! The colors and textures are a treat for all the senses. Great blog article! Love the scarf and the gorgeous beadwork! !